choosing the right custom t-shirt color with a complimenting ink color makes all the difference in the world as far as exposure. Let’s face it, the only reason we make custom printed t-shirts is because you want people to see your message, it’s a walking advertisement, a walking billboard if you will. The right shirt color and ink color combination is paramount to exposure. We did a recent study with our own logo and mixed and matched color combinations of shirts and ink and discovered the combinations that really popped garnered us the most exposure. We really didn’t have any idea how well a bright neon green with a white outline looked on a charcoal grey shirt. It’s an amazing contrast and really catches people’s eye. Choosing the right custom t-shirt color pays big dividends and the best part if the cost is not more than a shirt you may be wanting to purchasing, it’s just better use of color to gain the advantage. Shirts like Orange and Blues compliment each other so instead of having a white on a blue shirt consider using an orange ink. On the ever popular black t-shirt, print color means the skies the limit. But add some color, white prints on black shirts are the most cost effective but adding a secondary color is the difference between the same old black shirt with white ink or having a color that pops! Choosing the right custom t-shirt color in the end is a more cost effective method because the return on getting eyes on the shirts is so much greater. In the picture example you’ll see the difference choosing the right custom t-shirt color and complimentary ink color makes. Grey inks on purple look great, blues on orange look great, greens on grey look great, reds and greens on blues look great. Great is simple and simple designs garner exposure. 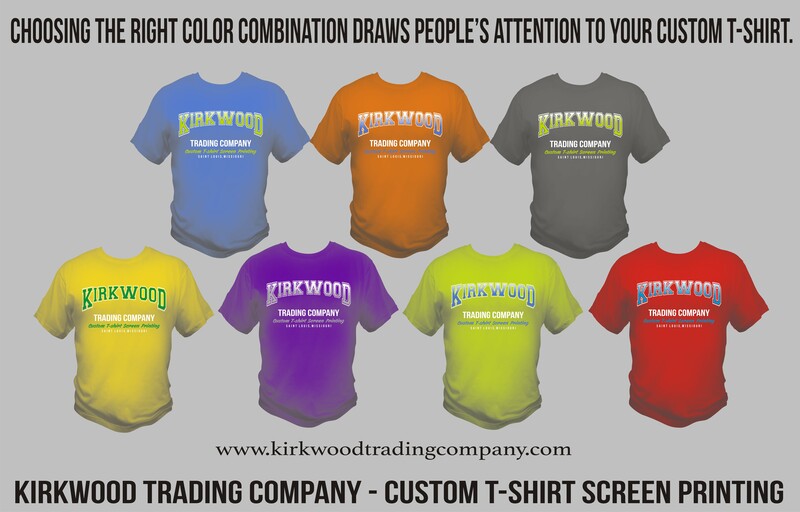 The next time you are in the market for custom printed t-shirts contact Kirkwood Trading Company and let our expertise go to work for you. We’ll discuss options so that the custom t-shirts we screen print for you are eye popping and get seen. That’s the point. Choosing the right custom t-shirt color can be a make or break on your investment. Contact us and invest wisely with your brand.